Is Fluoride Safe? That’s a question we get a lot here at Ballard Pediatric Dentistry. Here’s the deal: Fluoride is a mineral that is found in all natural water sources and is the ionic form of the trace element fluorine, which is commonly found in the environment. Using appropriate amounts of fluoride on a routine basis can help prevent tooth decay. Fluoride can be found as an active ingredient in many dental products such as toothpaste, mouth rinses, gels and dental varnish. It may also be added to community water supplies in areas where it does not occur naturally. Using fluoride for the prevention and control of decay is proven to be both safe and effective. Nevertheless, products containing fluoride should be stored out of reach of young children. Too much fluoride could cause fluorosis in developing teeth. Fluorosis is usually mild, with tiny white specks or streaks that are often unnoticeable. Fluoride inhibits loss of minerals from the tooth enamel and encourages remineralization (strengthening areas that are weakened and beginning to develop cavities). Fluoride also affects bacteria that cause cavities, discouraging acid attacks that break down the tooth. 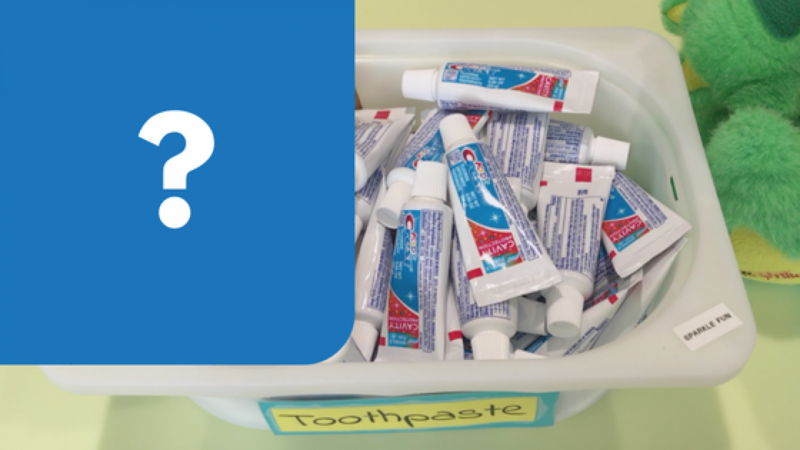 What type of toothpaste should my child use? When determining the risk-benefit of fluoridated toothpaste for very young children, the key issue is possibility of mild fluorosis versus preventing devastating dental disease. However, using the correct dosage of fluoridated toothpaste is the key to prevent caries and to prevent fluorosis. Fluoridated toothpaste is recommended for children as soon as the eruption of the first primary tooth happens. Make sure to use toothpaste that has the ADA Seal of Acceptance. Check out this video as our Dental Assistant explains in detail. If you have additional questions please feel free to give us a call at (206)-946-6970 or book an appointment online.